Just feel in the whisky-heaven! Great malt! 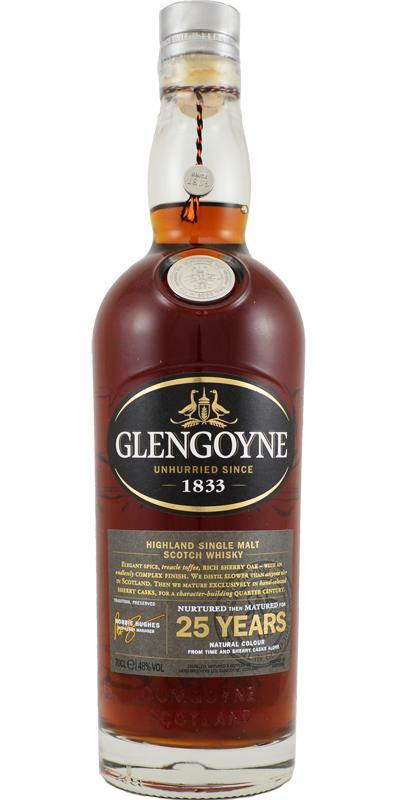 Immediately after pouring the Glengoyne shows already from its full-bodied, intense and elegant side. A luscious potpourri of red and ripe fruits (ripe strawberries, cherries, raspberries and blueberries) makes it easy for me to get out of my glass. Behind the massive sherry influence hide vast amounts of different flavors, which gradually crystallize during nosing. The alcohol (48%) is very well integrated in the nose and not noticeable. 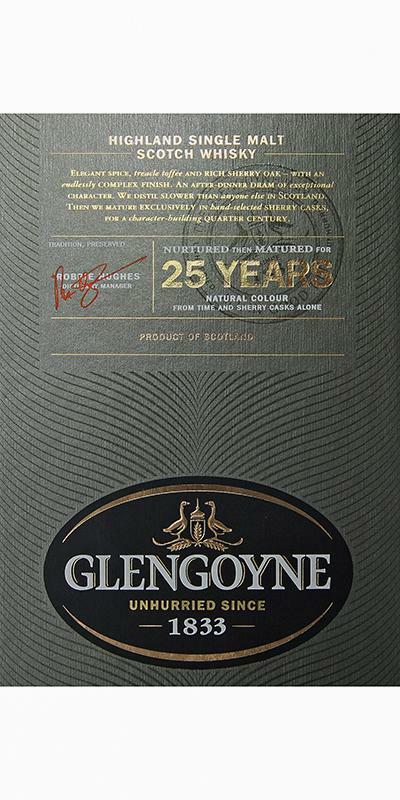 After about 20 to 25 minutes, the Glengoyne unfolds its full potential: juicy blood oranges with a sourish touch, raisins, plums, caramel, cane sugar, pipe tobacco, echoes of leather, Christmas spices, dark chocolate with a cocoa content of over 70%, walnuts and intense oak notes are strongly interwoven. The intensity, balance and complexity of the different flavors already conjure a smile in my face. Gorgeous! With a wonderful, oily texture, the Glengoyne spreads throughout the mouth. A pleasant sweetness runs down the cheeks, while the tip of the tongue uses a minimal amount of pepperiness and causes a slight tingling sensation. The alcohol content (48%) is perfectly integrated and always gives the malt sufficient strength. Old, intense Sherrynoten dominate the taste events. Red, cooked fruits, cherries, plums, blueberries, raisins and oranges I perceive. Burnt caramel, cane sugar, plenty of dark chocolate, cloves, cinnamon, nutmeg, hints of espresso, pipe tobacco, leather and spicy oak notes create a wonderful taste experience. Is someone firing a match in the distance? I mean a trace of sulfur, hidden deep in the background. Elegant, harmonious and gradually slightly drier on the palate. Chapeau! Long, warm, intense and spicy. Also on the finish line, sherry malt matured for at least a quarter of a century plays one ace after another. Dry sherry notes, plenty of dark chocolate, juicy blood oranges, walnuts, nutmeg, cane sugar, herbs, espresso and an intense oak flavor dominate the finish. Finally, a slight dryness and bitterness on the palate. 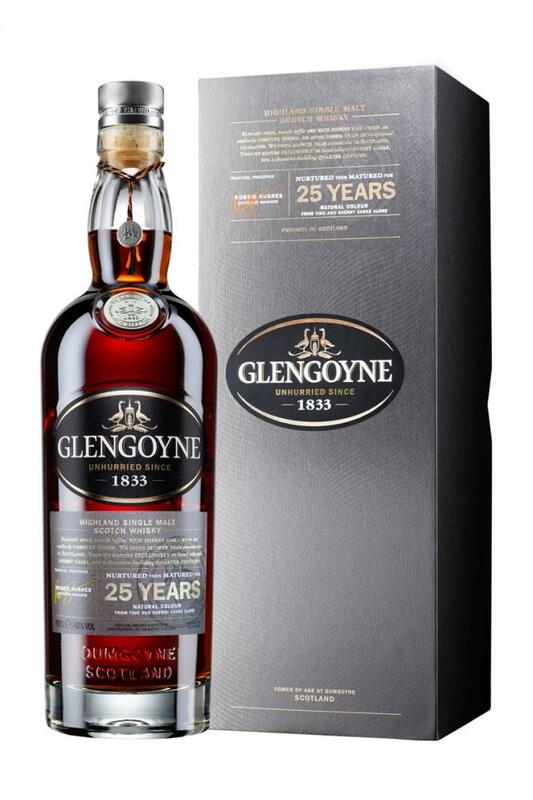 The Glengoyne 25 is a malt that inspires me again and again - incredibly intense and complex, the flavors change and regroup again and again. The wonderful nose also holds in the mouth, what it promises, and even on the finish, all the flavors are back ... a great all-round malt, great class! Comparing with the 21-year-old Glendronach Parliament and Glengoyne of the same age, one must of course say that the twenty-five-year-old can not be two and a half to three times better than he is in the price more expensive. However, the last few enjoyment percentages that make the difference between enthusiasm and ecstasy always have to be paid disproportionately high, always and everywhere. Whatever. 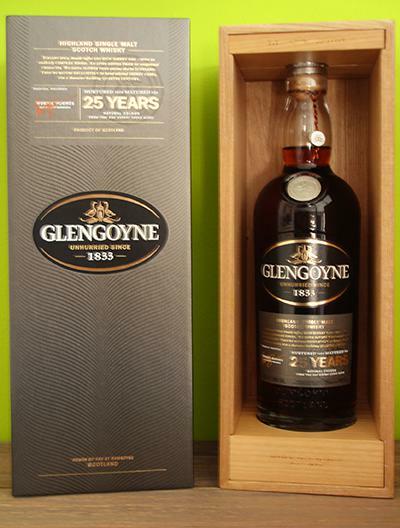 Anyway, the 25-year-old Glengoyne is a whisky that I can drink and enjoy for many years and especially with a deeper whisky experience, and I think there will be something new to discover every time. There are only a handful of whiskys (like the 21-year-old Old Pulteney) of the so far about 60 different tasted single malts that have opened up this perspective so far. After about 20 minutes, the dark fellow really does. Then, in addition to fruits such as plums and blueberries, you can also smell really sweet caramel, including a light, ripe, sweet fruit jam. / With a teaspoon of water, the alcohol refreshes again in a eucalyptus note. The light and dark fruit components rearrange themselves, the lighter ones come to the fore. Comes wonderfully strong and oily in the mouth. The sherry naturally determines the first impression. Then come the sweetish hulls and the dark compote. The 48% are wonderfully noticeable. The oak was more subtle at first touch than at the Glendronach Parliament, but more pronounced than at the 21-year-old Glengoyne. / With a teaspoon of water, the 25-year-old is surprisingly full in the mouth, the rum pot-sweetness increases. The strength of 48% is already a blessing. This is how it should be: medium to long, warming and on the palate, on the tongue and throughout the mouth. I have rarely "tasted" for so long and often. A good sign, too. If you had not both of them directly next to each other, you would not notice, but they are by no means identical. A battle of the giants, which are difficult to distinguish. It is nuances and personal preference that make you feel better. The '48 is a bit tart and spicy than the '46, which shows significantly more cane sugar and at the same time sweet and sour-fruitier acts, the '48 shows more oak, is "clearer", the '46 is creamier / heavier. With him it is more in the direction of milk chocolate, the 48er has a slight tendency to dark Schoki, the 46er are more red apples at 48er yellow, the 48er seems a bit musty, dusty and probably a tad older, these old "musty" flavors of Sherrys I find the 46er not. Again, the flavors approach slowly after repeated tasting. The 48 is a little less sour / sweet / fresh fruity finish, but older / heavier, old books, old sherry, a touch more chocolate, less cane sugar, but a very very similar finish, both are incredibly long and great in their own way ! One of my absolute favorites. A wonderful dram. Madness. Dark fruit, intense sherry. Wonderfully deep. Chocolate, red fruit, cinnamon, leather, earth, oak. Everything close to each other and everything very intense. In addition, a little orange, some polish, some coffee notes and always sweet currant. Long and intense. Chocolate, currant, leather, coffee, oak. It goes on forever, eternally long finish. The PLV of this bottle is clearly outstanding. Such a well-made 25 for this money should force other distilleries to THINK. Of course that is not cheap but who has tested it ... feels (tastes) immediately, I did everything right. A great feeling and that's why I own two pieces of it. After the tasting you know exactly, the nose is the best part. Since he is this sherry as you always know him from good bottles. There are matches that simulate the smoke. I like it a lot. This also simulates a fine tobacco fragrance. After a short time you start with apricots, raisins, figs, caramel pudding and orange plus peel. Now the apple. Slowly he gets more mature, juicier and sweeter. That goes up to baked apple. No alcohol, no annoying bitterness. I arrived in the whisky heaven. Respect Glengoyne. As expected long and recurring. Again, a "delicate" but pleasant bitterness clearly towards espresso. That's the way it has to be. Typical orange chocolate with all kinds of dried fruits. Stay, come back, stay ...... a dream! What a sherry board, a whole corner more intense and dense than the same age colleague of Glenfarclas. No malt that pleasingly lays on the tongue demands attention. Still not overloaded, but a great example of a very successful, long matured Sherry Malts. Dark and fat ... thickened sherry, leather, raisins, dates, old wood - as expected very full and heavy Sherrynase. The spice content is initially restrained, but it turns out then but a nice combination of lovage, rosemary, cloves, cinnamon and cardamom out. Black cherries enhance the dark fruity impression. Dark chocolate, freshly brewed espresso and tobacco notes follow. The heavy sweetness of black cherries, directly spicy with rosemary, thyme, cloves and cinnamon, is also reflected in the agreeably strong onset. Dry with a lot of oak aroma. Roses and dates, dark chocolate, roasted almonds. And the oak as a constant companion. Great spice that continues to spread, continues to strengthen and lines the whole mouth. Leather and tobacco notes, the spices are now slightly scorched. Very intense and dense, to chew on. Long and with great chocolate and coffee notes. The oak flavors accompany you to the end, make the finish pleasantly herb-spicy, but also let some of the cherries, the raisins and the dates shimmer through. I tried to stay objective. I hope I have succeeded. I was flashed. A big movie theater. We are in the area of ​​lonely top. 94 points. Heavy, dark sherry flavors. Wine-soaked wood is included. It takes a while to get through the spicy compote of dark dried fruit. Raisins, prunes, Christmas spices. Dark chocolate. Some black pepper is in the background, just completely removed. Then comes sweet leather. Cherries that have fallen from the tree, were overlooked at the harvest and therefore battered battered in front of him. Nuts come with time. Nutmeg, hazelnut skin. Strong toasted pastry with not too sweet cinnamon. Plum jam. Dried strawberries. Sweetish tobacco. Full milk chocolate. Wall unit. Leathery cherries. Incredibly creamy. Prunes. The chocolate is getting darker and darker. After swallowing a lot of fruit and leather remains to be tasted. Noble bitterness. The second sip is even more tasty, chocolaty with berry fruits, rum raisins. With each sip it gets better. So creamy. So full. In the meantime really cute. The tongue is covered and leathery. Very long and warm, dominated by tobacco, raisins, plums and dark chocolate.